This dynamic strategy allows us to grow. Our reputation, validated by numerous prises and awards, is now strong from Paris to Seattle. At the opposite of yield maximizations practices of some, Laurent Perrachon offers very high quality wines that have received numerous awards, like "coups de coeur" from the Guide Hachette. Our red and rose wines come from a single varietal, the gamay. Our vines are pruned short, in "gobelet" and "Cordon de Royat". 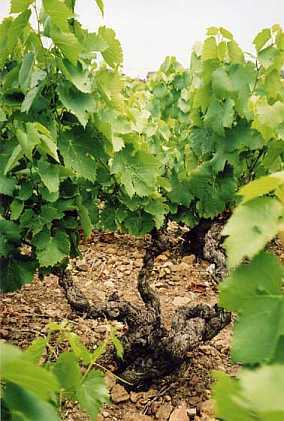 Part of the property is planted with very old vines, 80 to 100 years old, like the one at left! Our white Beaujolais is made of chardonnay, the traditional varietal of the great white Burgundies. Here, the harvest is still done by hand. Traditional Burgundy winemaking techniques are combined with the carbonic maceration typical of Beaujolais. Fermenting lasts 6 to 8 days for our "Villages" up to 14 days for our "Cuvées Spéciales". The wines are then maturing slowly in our 1702 cellar, to the bottling, starting around Easter. Some of our wines can age more than 5 years to reach their best. We have opened recently a 10 year old bottle of Julienas Vieilles Vignes, which was superb . In an article by the trade magazine "l'Hôtellerie-Restauration" from novembre 2002, the journalist relates the tasting of a 30 year old bottle which was "a régal" (fit for a king). In July 2014, our Julienas Vieilles Vignes has been greatly appreciated during a prestige wine tasting at the Hotel Saint James Albany in Paris. The Domain offers three lines of wines. We are also the independant winemaker offering the largest offering, without "négoce": six on the ten in the appellation. The crus: Chénas, Fleurie, Juliénas, Morgon, Moulin-à-Vent et Saint-Amour. The special cuvees: Laurent expresses all his winemaking skills, his creativity, while respecting tradition and the knowhow transmitted by his ancesters. They are all aged in oak barrels, for up to 18 months. They are issued from the best parcels: Juliénas Vieilles Vignes, Morgon Côte du Py, Moulin à Vent vieilli en Fûts de Chêne, and Julienas "L'Irresistible". They will surprise you with their depth, their complexity. They have now a world wide following. Those are wines that will age easily for 10 years when kept in a proper cellar. The Beaujolais : Beaujolais Villages, Beaujolais Villages "nouveau", Beaujolais rosé, and our Beaujolais blanc (white) made of chardonnay. Cremant de Bourgogne: 100% chardonnay, the refinement of a traditionnal "Blanc de Blanc"